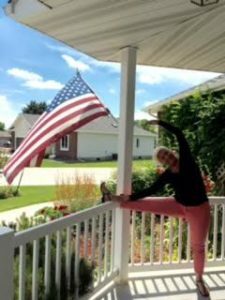 For Americans, freedom is what our Fourth of July holiday is all about, and today I am celebrating the freedom I feel in my body due to Essentrics. That includes being both pain-free and able to pursue any activity I enjoy. This pic was taken on my mom’s front porch while I was in Scottsbluff, Nebraska for my 40th high school class reunion. Great fun! After decades of searching, Essentrics is the only exercise program I have found which rebalances the body and can actually relieve pain in the joints, sometimes putting off–or avoiding–joint replacement surgery. This is great news for two segments of the population: athletes and those of us who are getting older. Hmmmm… Sounds like all of us! Find more freedom in your body by joining me for live classes on Mondays, Wednesdays, and Fridays at 10 AM, Sundance Studio. Terry Nolan offers three additional classes each week, including one at 5:15 PM on Wednesdays for the after-work crowd. If you want the freedom of doing a workout anytime, check out the many DVDs available or online streaming for only $15 a month atessentrics.com. If you want freedom from paying, record and watch Classical Stretch on PBS for free. But whatever you do, keep moving!